MasterCraft Lake Powell is proud to service visitors from all around the world as the only full-service marine dealership in Lake Powell. Because Lake Powell is one of the greatest boating vacation destinations in the world, MasterCraft Lake Powell is a landmark when it comes to planning your vacation. We offer a wide range of products and services to help you with all your boating needs, such as boat sales, service, parts, year-round storage, valet service, pro shop gear and boat rentals. Part of the award-winning dealership recognized for our outstanding customer service, our staff is available with the knowledge to give you a personalized buying and service experience like none you’ve ever had. 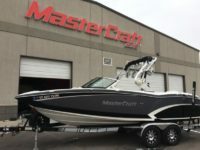 Come see why we are one of the top MasterCraft dealers in the world! MasterCraft takes superior craftsmanship and performance to the next level. Our entry-level NXT Series to our premium yacht rated X26 come sports-ready, equipped with our award-winning GEN2 surf system. Whatever your pleasure is: surfing, wakeboarding, skiing or tubing, we have a boat to fit your lifestyle. MasterCraft is committed to generating memories that last a lifetime. You only have 18 summers with your kids, how will you spend them? Let Utah Water Sports and MasterCraft make those 18 summers unforgettable. While on our family vacation from Denver at Lake Powell, our surf boat a Tige Z3 had the low pressure fuel pump go out. With great coordination from our dealer back in Denver (WWS) and with Don at Mastercraft we were able to trouble shoot the issue. The parts were shipped overnight from Denver and delivered to Don and then he brought those parts up lake 56 miles which enabled us to make the repairs and finish our vacation with our only boat. Thanks cannot go far enough for the personal customer service that we received from Don and the staff. We know how busy Lake Powell can be for everyone and to take the time like you did for us was fantastic! We were recently at Powell for the 4th of July when the drive shaft on our 2015 MasterCraft X23 snapped during our early morning run. We happen to drive past and saw that the dealership was open! Hoping to save a bit of our vacation we stopped by and although it definitely wasn’t expected, they were able to replace it and have us back on the water the same day! One week later we gave the boat to them for routine service. We got a call informing us that they found a major repair needed. We were extremely worried knowing that 3 days later we had planned for 15 people to go to Powell with us and we didn’t have a boat to use. The guys there were amazing. They assured us that if it wasn’t fixed, we could use a loaner until it was. We called up to check a status the day before and sure enough, they had someone drive the needed parts from Salt Lake down to Page just so we could have it on time.